Let’s say, you’re visiting San Francisco. You go to the supermarket, put a bottle of water, dental floss, some apples and vitamins in your shopping cart. You’re ready to pay. So you go to the checkout. And the cashier asks, “Cash or charge?”. Do you understand the question? Well, she wants to know if you are paying in cash or paying by credit card. 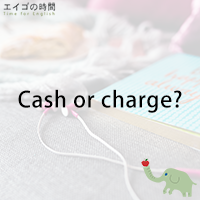 If your answer is “Charge, please” or “By credit card”, the store will charge the purchase to your credit card account. Now, some of you might wonder why “charge” means “paying by credit card”. I’m going to explain that and further discuss how to use the word “charge” on the website. So please make sure to come visit us on Thursday. 1. “Cash or charge” means “No credit cards accepted”. 2. When you pay by credit card, no discount is given. 3. When you’re done shopping at the supermarket, you go to the checkout. Next Post 勘定は部屋に付けてください – Charge it to my room, please.